Following on from the 2017 introduction, 2018 sees Auto-Sleeper Peugeot Engines continue to opt for the Euro six diesel engine. This is with the (bluehdi adblue) AdBlue technology on new Coachbuilt and Van Conversions. AdBlue, unlike fuel it is not injected into the engine. But, directly into a specially modified part of the motorhomes exhaust system. The Blue HDi is the name given to Peugeot’s latest fuel and environmentally efficient Diesel engines, The Blue HDi has evolved from a world-famous Peugeot diesel heritage So, the Auto-Sleeper Peugeot Engines Blue HDi complies with Euro 6 emission standards. In addition, delivering both power and performance. However, with exceptional fuel economy and CO2 emissions. In fact, this is mainly due to the Selective Catalytic Reduction (SCR) and Particle Filtration processes. In fact, the Peugeot Blue HDi delivers one of the cleanest diesel engine possible and exceptional fuel economy. Peugeot have been supplying chassis and diesel engines to Auto-Sleeper for many years. Modern diesel engines continue to develop however, the phasing out of diesel engines is going to happen. Currently, there is a three stage cleansing process that targets the pollutants of diesel combustion. Therefore, removing hydrocarbons and carbon monoxide. Thus, reducing nitrogen oxides by up to 90% and eliminating 99.9% of particulates! the oxidation catalytic converter eliminates the HC and the CO2. Therefore, then transforming them into water (H2O) and carbon dioxide (CO2). the SCR (Selective Catalytic Reduction) transforms the nitrogen oxides (NOx) into water. Thereafter, the nitrogen (N2), which is the main constituent of air (78%), due to the addition of AdBlue® (mixture of urea and water). the Particulate Emission Filter eliminates 99.9% of the particulates by number. There are many reasons to understand the new technology and the implications of the impact on the environment. All manufacturers know they have to find alternatives. However, for the time being diesel have a presence over petrol engines. What happens if my Ad Blue® runs out? Well, first do not panic. If your AdBlue® runs out, your vehicle will then stop. Also, the motorhome will not be able to be driven where emissions are not met. Will I get a warning? Yes, however to avoid running out please keep a look at your UREA warning lights. So, when there is 1,500 miles left in the the tank. This engages an orange UREA warning light and audible warning to alert the driver. In fact, at 350 miles the there is red UREA warning light and a service warning light. Also, again an audible and verbal warning. Also, be aware that if the driver continues until the tank is completely empty. Once the vehicle is off the vehicle will not restart. How far will a tank full go? 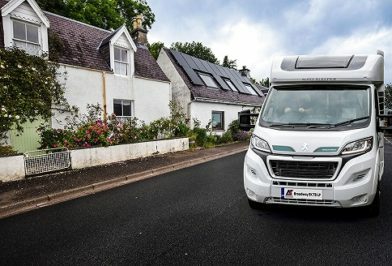 The average annual motorhome mileage is between 6,000 – 8,000 miles, the AdBlue® tank if full is more than capable of these sorts of distances. Also, on the annual service the Peugeot dealership will top up your AdBlue® as part of the service. Therefore, for the majority of motorhome customers there will be no need to fill up between services. So, a top up is easy from your Peugeot dealership or most service stations. No, there is only one type of AdBlue®, which is on sale from either a Peugeot dealership or most fuel stations. No, on a boxer base the engine is a 2.0, which is lighter than the Euro 5 engine. Therefore, there is no difference in base vehicle payload from Euro 5 to Euro 6. 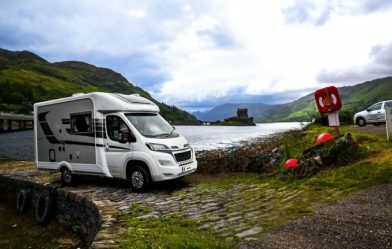 As the average annual motorhome mileage is relatively low. So, with the majority of customers the AdBlue® will be part of the maintenance at the annual service. However, your Peugeot dealer will top up 10 litres at a fixed price of £9.99. Yes. The 15-litre tank is accessible from the outside and is under the fuel filter.